I wake early this morning, no doubt a result of our lion-induced super-early bedtime. We both slept better than we expected, I think, and the night passed without incident. It's been raining for a couple of hours, and gusty. I listen to the iPod in the safe orange cocoon of our tent and wait for Bryan to stir. Breakfast in bed, sort of. The rain gives us a little break, so we get up and begin cooking breakfast. 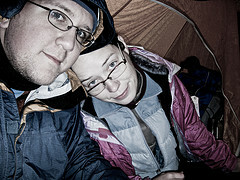 I move the packs inside the tent as it starts to rain again, and we finish cooking and eating our meal sitting in the doorway under the little awning. As we eat toasted bagels and oatmeal and bacon, we watch the light winter rain turn to sleet and then to snow. 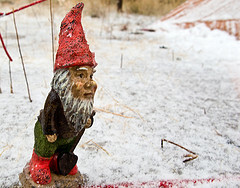 Our faithful traveling gnome serves as a tent stake, replacing the one lost in the windstorm, while our tent collects snow. 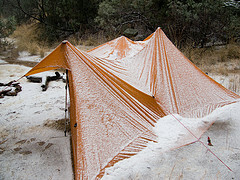 We pump water and pack up camp in the falling snow, then head down the ridge. 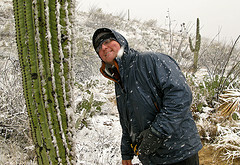 I like hiking in the snow, and Bryan begins by enjoying it but after several hours the novelty wears off; his feet hurt and he doesn't like the falling snow in his eyes. The fact is, though, that the snow is beautiful stuff: puffy, Christmassy flakes covering the trail and softening the edges of the world. As we descend we see, again, ocotillo, then more and more yucca and cholla, and finally the first saguaros signaling our much lower elevation. The lone hiker we'd encountered is gone by the time we get to the Javelina picnic area, and we have three miles of road hiking before getting to the truck. We could both walk the road with our packs, but since his feet are starting to hurt, Bryan volunteers to wait in the damp cold with my bag. 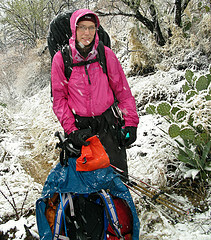 I'm grateful to be rid of my heavy pack and enjoy the soggy walk on Cactus Forest Loop Drive. Not a single tourist offers me a ride, but I'm warm in spite of the rain. The far-off mountains are still shrouded in clouds, but the closer, lower peaks are snowy. I hold Bryan's pack while he takes a few quick photos and then I snap a picture of his silly grin. Spirits were still high! The truck is a welcome sight and I drive it slowly back to pick up Bryan, who reports that all the old picnic shelters leak. (Apparently, actual rain shelter is not an important design feature in the desert.) We hurry to the visitors center to check in with the rangers before they close at five; it isn't a requirement but we want to log our encounter with the mountain lion. They are interested in our story and tell us that a lion had been reported by someone else not long ago, on that part of the ridge. We also fill out a complaint form indicating that the bathrooms should be more conspicuous. 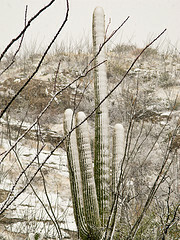 Click the photo to see a larger version since it is stitched together from six images to form a 41 megapixel image. 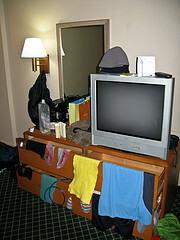 I come up with a plausible reason for another hotel stay: our gear is all soaked, and we need to be dry and organized before starting home. The hot shower and clean socks feel good, and so does the prospect of a big supper. I love the fact that we have a favorite restaurant in Tucson. We wait for our table in El Charro's bar, and when we're finally sitting in the warm dining room we enjoy our enchiladas and tamales and tres leches cake. We're tired but not miserable, at least as long as we don't touch our calves, which were fine earlier today but are now suddenly very sore.